This is not a typical blog for this page. Instead of discussing recent site visits or photographs we’ll be looking at a recent controversy sparked by comments about the reconstruction of Newgrange and, in particular, three claims made in the media by an Irish archaeologist; 1. That the “roof-box” at Newgrange may not be an original feature, instead it was “fabricated” and has “not a shred of authenticity” 2. That two vitally important structural stones, both decorated with megalithic art, from Newgrange were lost after the excavation and 3. That the photographic evidence that backs up the existing restoration is either inaccessible or never existed at all. I hope to show why we can be sure none of these claims are sustainable and that in fact the winter solstice phenomenon at Newgrange is an original and central feature of the tomb. Winter Solstice at Newgrange. Today two beams of light, one from the doorway and one from the roof-box, illuminate the passage. December 21st, 2016: The Winter Solstice falls on the traditional day on which the largest crowds, various VIPs and the media gather in front of the great passage tomb, situated on the brow of a ridge overlooking the Boyne River and its fertile floodplain. At 8.58am, if a stubborn cloud bank on the southern horizon had dissipated, those lucky few people who had the privilege of waiting inside the chamber within would have observed one of the most ancient, spectacular and moving displays of all prehistoric archaeology. One which magically combines engineering, artistry, drama and spirituality like few other constructions before or since. The discovery of the alignment towards the rising sun on the shortest day by the excavator of the tomb, Michael J. O’Kelly (known to friends and associates as Brian), in 1967 had caused a sensation. Not only did the passage of the tomb face directly at the point at which the Winter Solstice sun rose above the horizon at the time of its construction, circa 3200BCE, the builders had also installed at Newgrange a unique and ingenious device through which the sun could illuminate the floor of the chamber 19 metres (60 feet) distance within the mound, even when the massive door-slab sealing the tomb was in position. O’Kelly’s discovery was surveyed and assessed by Patrick, the results being published in 1974, demonstrating that the probability of an alignment towards the rising sun on the Winter Solstice was extremely high, enough to conclude it was deliberate (Patrick, 1974). This claim was subsequently strengthened by Tom Ray in his own 3D analysis (Ray, 1988). It has been suggested that other passage tombs may originally have had a similar feature, though such a construction has thus far never been found in situ elsewhere. Claims that a roof-box had been constructed at Cairn G at Carrowkeel in Co. Sligo are difficult to prove, the supposed opening, which is much narrower than at Newgrange, is in fact very similar to those over the three recesses in the chamber and may simply reflect the preferred building method of the builders. O’Kelly named the feature the ‘roof-box’. The front lintel of it protrudes through the grassy mound in historical photos and artist’s representations of the monument. Workers under the direction of Richard Burchett tried unsuccessfully to shift it using crowbars in 1874. There was speculation that it indicated the entry point to an undiscovered passage, or was a receptacle for offerings to the dead within. What O’Kelly found on removing the covering cairn however was remarkable. The Newgrange roof-box, viewed from the exterior of the tomb. In front of the roof-box is the first roof-stone of the passage, RS 1. Below the decorated lintel is what O’Kelly called the ‘Back Corbel’ and behind that is Roof-stone 2 (RS 2). The Newgrange monument was built on the narrow crest of the ridge, to the front the passage sloped downwards from the chamber towards the entrance and at the rear it also followed the fall-off in the ground level, covering an earlier turf mound in the process. As you walk through the passage and enter the chamber you are also climbing this slope, a height difference of some 2m. The overhead roof-box that you pass beneath on entry is now at the level of your feet. A slight bend in the passage and the constraining effect of the upward slope combine to restrict ambient light from the entrance reaching the chamber and so the chamber remains almost totally dark throughout the year. An unforgettable moment: Winter Solstice Sunrise illuminates the floor of the chamber of Newgrange in 2010. Viewed here from the chamber floor you can see the roof-box directly ahead. Due to the slope of the passage the roof-box and entrance are not visible while standing in the chamber. Illustration of the Winter Solstice illumination of the chamber and passage. As can be seen, before the restoration, the slumped position of RS 2 and RS 3 would have prevented any light reach the chamber. Illustration: Vallancey 2016, after Stout & Stout 2008. On this particular day, unfortunately, the sun would not appear in the chamber. Instead of the iconic warm glowing pictures of light on the chamber floor, Newgrange was making headlines in print and across social media for a totally different reason. In the December 21st edition of the Irish Times journalist Lorna Siggins had a different take on the spectacle we had waited over-optimistically for. Quoting archaeologist Michael Gibbons, Siggins made a bold claim: the famous spectacle made possible by the roof-box, which had put Newgrange on the world map, was a “fabrication” with “not a shred of authenticity”. The remarks formed part of a report on a paper published by Michael and Myles Gibbon describing possible Iron Age features at Newgrange that may represent significant cult activity at the site during this period, connected with events in Roman Britain. In further comments on Irish radio, Gibbons suggested that the roof-box we know today was in disarray when O’Kelly found it and it was an imaginative interpretation that saw it end up as a special opening that allows the solstice light to strike the chamber floor. It was, Michael said, like picking up the pieces of a broken bottle and fitting it all back together with a mixture of old and new pieces. In his view, it is impossible to say what the structure was like in antiquity, the excavation report did not contain enough detail and photographic evidence to back up the modern reconstruction. The archive, we were told, was not publicly accessible. Worse still “two of the key stones from it went missing, they’ve been lost, I’d love the minister to tell us what happened to those stones” therefore we can no longer test whether the reconstruction ever matched what was there originally. Are any or all of these claims based on fact? Archaeologists and other interested parties were quick to address the claims. Within the articles themselves, archaeologist Robert Hensey disputes them and later gave a detailed reply on the Moncrieff show on Newstalk Radio,the Office of Public Works issued a brief statement with accompanying photographs of the lintel and partially uncovered roof-box in the early 20th century and in a letter to the Irish times, four prominent figures in Irish archaeology, all former students of O’Kelly, strongly disputed the assertions. What has been lacking, however, has been a demonstration of the case supporting the current roof-box reconstruction, supported with excavation photographs and illustrations which help prove the entire roof-box was found intact and was restored with the highest possible precision. Gibbons does raise a valid point in that the excavation report published by O’Kelly has few detailed photographs of the roof-box structure. It must be borne in mind, however, that while O’Kelly may have known his restoration was controversial, he probably did not foresee claims that major structural elements were fabrications, so the provided illustrations may have been seen to be adequate at the time. Let’s examine the evidence for each assertion in turn and hopefully along the way test some of the claims and rumours that surround the authenticity of the solstice event at Newgrange. Claim 1: The roof-box was “fabricated” and had “not a shred of authenticity”. It was made higher and wider to allow the sunrise light reach the chamber. This claim seems very difficult to sustain, early photographs and drawings show the lintel of the roof-box in what seems to be an identical height and position behind roof-stone 1 (RS 1). Photo c. 1880 by R. Welch, note the decorated lintel set behind and above the passage entrance, just as it appears today. In the rarely seen photo below, we can see the roof-box uncovered as the cairn stones around the passage are in the process of being removed. We know this was taken before the reconstruction or the straightening of the passage orthostats because the base of the original cairn is still in place and the concrete walls that run the length of the passage, and which stand taller than roof-stone 1, are absent. A large cutting down to the old ground level had been made during the excavation to allow the orthostats to be restored to the vertical, this was completed before the roof-box had been re-assembled (O’Kelly, 1982, pg. 89). Note the height of roof-stone 3 (RS 3), the long capstone running behind the roof-box, it will become important later. The roof-box as originally uncovered during the excavations. Note the position of the rear large roof-stone (RS 3) at almost the same level as the forward large roof-stone (RS 1). The concrete walls built later along the rear of the passage orthostats is not seen in this photo and the cairn behind has yet to be removed. Photo from Michael J. & Claire O’Kelly – Partnership in Prehistory. Below are just a small selection of the numerous photos of the Roof-box and passage capstones being fitted back in position according to exact measurements and with reference to large scale drawings (O’Kelly, 1982, pg. 112) visible in the bottom right photograph (Michael J. & Claire O’Kelly – Partnership in Prehistory n.d.). Reconstruction of the passage capstones and Roof-box under the direct supervision of O’Kelly, using detailed large scale drawings. Photos from Michael J. & Claire O’Kelly – Partnership in Prehistory. In the excavation report itself (O’Kelly, 1982), two photographs were presented of the uncovered roof-box, plates 41 and 43. Plate 43 is from a downward angle and shows the first few metres of the passage. The roof-box is visible, but due to the angle it is difficult to judge with certainty if the structure had collapsed in on itself. Plate 41 is a tightly cropped photo of the entrance and roof-box taken from a position in front of the entrance. It shows the supporting stones beneath the decorated lintel and the back corbel but due to the lack of context around the structure it could be hard to tell if this was before or after the reconstruction. The caption, however, indicates it was after the removal of the surrounding cairn. Below is a comparison of the appearance of the external Roof-box structure before and after reconstruction. Compare each block supporting the corbel slabs that in turn support the back corbel and decorated lintel. Each stone is identical, the original stones were re-used in the re-building of it. The height and the width of the roof-box also appear to be identical. Click the photo to enlarge. The Roof-box before (left) and after reconstruction. Compare the size and shape of each of the visible stones supporting the upper components of the Roof-box. The height and width of the opening looks identical before and after. Pre-reconstruction photo after O’Kelly. This claim, also from an interview with Matt Cooper on Today FM, is the easiest claim to settle, the two stones that formerly supported the roof-stones and back of the roof-box are in fact exactly where O’Kelly stated they were, in the National Museum in Dublin. Here they form the interior of a mock-up passage tomb built into one corner of the museum and are available for public viewing. See the drawings of the carved stones below, and photos of the stones as photographed by me in the museum in 2011. Click on the photos to enlarge. Left Corbel 3 (above orthostats L 5-6) and Right Corbel 3 (above orthostats R 4-5). After Clare O’Kelly. Left Corbel 3, as found in the mock-up passage tomb in the National Museum in Dublin. Right Corbel 3, as found in the mock-up passage tomb in the National Museum in Dublin. Incidentally, one of the corbels (Right Corbel 3) has a wonderful example of the unique ‘water grooves’ cut into the roof-stones of the passage to drain excess water out from the passage into the surrounding cairn. All of the other examples in the monument itself are hidden from view within the cairn or purpose built tunnel. Special permission is required to view these. EDIT 28/12/16: Michael Gibbons has since asked to clarify that the two lost stones he was referring to were quartz blocks that O’Kelly believed were used to block the roof-box before and after the solstice. However, only one such stone was found during the excavation, where it had fallen into the opening of the roof-box. A second stone was never found but O’Kelly inferred from scratch marks on the top surface of RS 1 that a second had been present and both were repeatedly moved to allow light enter the chamber (O’Kelly, 1982 pg. 96). The quartz block that was present was not a structural stone and would not demonstrate if O’Kelly’s reconstruction of the roof-box was legitimate or not. The current location of this quartz block is apparently unknown. Claim 3: The excavation remains mostly unpublished and there is no publicly available photographic evidence to back up the restoration of the roof-box. The O’Kelly archive is in fact accessible to any member of the public, an appointment is necessary to view it however. This was clarified in the press statement made by the OPW following the publication of the article and has been the case for several years now. Contact the National Monuments Service Archive for more information. So if the roof-box was in good condition when found and was restored faithfully, there is then no reason to suspect the illumination of the chamber was an original feature that guided the construction of the tomb? Not quite, there is one further objection that is sometimes raised to the restoration and the resulting beam of light that, in c3,200BC, would have lit up the very rear of the terminal chamber. Behind the roof-box there are two roof-stones, RS 2 and RS 3 that are not currently in the position that they are drawn from the pre-excavation surveys. They are both significantly higher. If they had been in the lower positions originally, no light may have reached the chamber at all. O’Kelly describes the reasons for this in the published excavation report: the corbels that were once seated above the orthostats had slipped under the weight of the massive cairn above them and now rested behind the orthostats, helping to push them inward to create the very tight passage that earlier visitors struggled to squeeze through. The section drawings above also show the corbels splayed out so the inner wall of the corbelling was significantly compressed. O’Kelly notes the same effects can still be seen today further along the passage in the area where the overlying cairn had not been removed (O’Kelly, 1982 pg. 96). When the passage orthostats were straightened and the corbelling reinstated to their positions above the orthostats, the resulting lift clears the path for the solstice light to penetrate the chamber. The reconstructed passage and roof-stones, note that RS 2 and RS 3 and now higher and the resulting gap allows the beam of light to reach through the passage. Illustration after O’Kelly. It is clear that, if the alignment was to function, both RS 2 and RS 3 had to have been higher in the original construction. If one or both were significantly lower then the phenomenon simply would not work. Another of the unusual engineering techniques used by the Neolithic builders simplifies this problem somewhat, the gap between RS 2 and RS 3 had originally been sealed by a putty made of burnt clay and sand which prevented water from passing through. This putty was suitable for radiocarbon dating and the resulting dates matched those found further along the passage, where the roof rises to meet the chamber. The presence of this putty in this position strongly suggests that both stones were originally fitted together, if one is lifted by the reinstatement of the corbelling, then the other must move in tandem with it to preserve the original relationship. If only one had slipped, the putty seal would have been ruptured and the traces likely washed away. If both stones had not been laid in close proximity originally, the putty seal between them would not have been required. The photo below of the reconstructed outer passage shows the position of the front edge of RS 3, it is approximately 20cm above that of RS 1, which rests directly on top of the outermost orthostats. Because there was no corbelling in this outer part of the passage, we know the height of RS 1 has to be original. In the section drawings in O’Kelly’s book, the front edge of RS 3 is shown practically level with RS 1. Therefore, it only needed to be raised by 15-20cm for the Roof-box to project light onto the floor of the chamber. Even by a conservative guess, judged by the extent of the lean of the orthstats and the compression, the combination of the lift provided by straightening the passage orthostats below RS 3 and the reinstatement of the corbelling is more than adequate to facilitate this size of a gap and would certainly have allowed the angle of the light to illuminate the chamber floor, if not the back wall of the rear chamber, both after the original construction of the monument and today. If, on the other hand, the reconstructed roofing of the passage had turned out to be too high, this would have had no effect on the phenomenon visible in the chamber as the maximum height of the beam is determined by a particularly low lintel further along the passage and the pronounced lean still present at orthostat L20. Looking from the passage outwards through the entrance and roof-box, December 2015. Note the gap, measuring about 20cm, between the front edge of RS 3 and RS 1 in front of and below it. The reconstruction methods used by O’Kelly, however archaeologists today judge their appropriateness by current standards, ensure the slippage and compression that previously blocked the Winter Solstice light should not recur. We can reasonably expect this phenomenon to occur and be witnessed by many generations into the future. RAY, T. 1988. The Winter Solstice Phenomenon at Newgrange: Accident or Design? Nature 337. 343-345. Campo Lameiro, in the mountainous heartland of Galicia in the north west corner of Spain, is home to one of the most significant prehistoric rock art landscapes in Europe. Over 4,000 years ago, people carved a bewildering array of symbols and schematic representations of animals on the wooded hillsides, using the many exposed granite outcrops as their canvas. The expertly carved motifs range from the classic abstract circular ‘cup and ring’ motifs that are ubiquitous across the Atlantic rock art tradition of Western Europe, to majestic stags of all sizes, some of which feature particularly magnificent antlers. If you look carefully you may even spot a rare horse or two. In recognition of the special cultural and heritage value of the area, and to make the rock art more accessible, an archaeological park with an excellent interpretative centre was opened in 2011. Now, visitors can enjoy many of the carvings along pleasant mountain trails that wind through open grassland and wooded groves of native species which are more in keeping with the relict landscape. Explanatory panels help to identify the various elements of the carvings. As with the museum exhibition itself, they are all in the native language. Maps and information in English are provided in the visitor centre. Rock Art is so abundant in Galicia that drawing up a list of even a dozen must-visit sites would be difficult. However, there is no better place to start your explorations than here at Campo Lameiro. The permanent exhibition explores many of the theories and speculations that surround the mysterious signs and symbols, while a recreation of a small Bronze Age settlement is tucked away in a charming little meadow. The staff and guides are some of the most enthusiastic and well informed of any heritage site I’ve yet visited. Usually, the carvings are best seen in summer under the late evening light. Only the most deeply carved motifs resist being washed out in the texture of the granite under the mid-day sun. 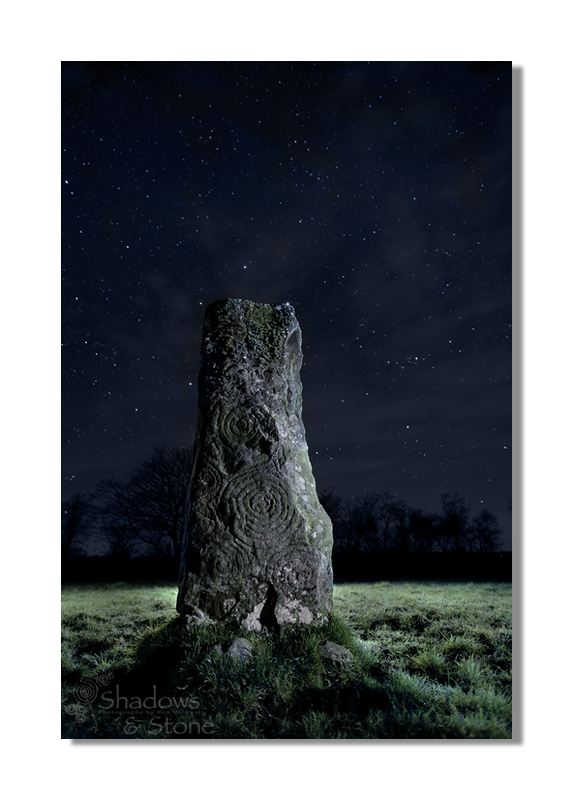 On certain nights of the year however, during the high season, you can book a place on a very special tour after nightfall where even the most faded carvings come to life under the skillfully guided beams of torchlight provided by the park guides. I was very lucky to have booked a place on the first tour to provide dual Spanish-English guides. Benito Vilas Estevez and Elena Tabodao Duran drew on their experience, knowledge and passion for the rock art to immerse the guests within the prehistoric landscape, while the accompanying guides dramatically revealed the significant carvings with torches (and also helped one over-enthusiastic photographer navigate the pitch-black woodland after falling behind the group). The remote location of the park also means that light pollution is at a minimum so the area is also a great dark-sky location for viewing the stars and planets. The park is taking full advantage of this to offer some very special night tours this month, where Benito Vilas will be sharing his expertise in rock art, archaeology and ancient astronomy. I was delighted to see that the park had chosen to use one of the images from my visit on the poster for the event below. See the full details on the park website or on their Facebook page and please enjoy the galley of photographs from my visit below. Click the ‘Play’ button below to start a slideshow. You can also click this link to view larger in a new window, or if you are using a mobile device. There’s a really special atmosphere at Newgrange on a sunny winter solstice morning, especially so this year since there hadn’t been a clear sunrise here on the 21st of December since 2007. This morning was surely one of the most memorable and welcome sunrises in recent years. Most of the people who had made their way to the ancient passage tomb had come prepared for the worst, it seemed unlikely that the thick cloud and driving rain would ever clear. As dawn approached, however, a clearing to the south west began to spread east, sweeping the horizon ever closer to the point on the opposite ridge where the sun was soon to appear. The moment of sunrise passed, a stubborn bank of cloud sat just where the disc of the sun rises above Red Moutain. Within 15 minutes or so the window within which the sunrise can reach the chamber down the long passage would pass and the chamber would remain in darkness. The drumming and chanting from the crowd grew louder and louder, then all of a sudden a dazzling burst of light reached across the river valley, turning the white quartz facade of the 5,000 year old passage tomb a glorious golden orange. Accompanied by a loud cheer, the sun finally stretched across the floor of the chamber within the tomb, much to the delight of the lucky children and adults who had won places to witness the event inside the chamber. ‘I was literally astounded. The light began as a thin pencil and widened to a band of about 6 in. There was so much light reflected from the floor that I could walk around inside without a lamp and avoid bumping off the stones. It was so bright I could see the roof 20ft above me. Gathering outside the monument has become a yearly tradition and it’s always great to old faces and new, catch up with the year’s events and look forward to the Christmas holidays and New Year ahead. The staff from the Office of Public Works deserve huge credit for the warm atmosphere and smooth running of the event each year, alongside all the other organisations and volunteers who help keep the event a family friendly affair. It’s great to see the smiling faces of the children emerging from the passage after witnessing something they may remember for the rest of their lives. Having seen their wonderful art hanging in the visitor centre, it was surely a very well deserved prize! Congrats to all the winners of the school art competitions and well done to everyone who took part. It’s been a while since the last blog update and there’s quite a backlog of photos and wonderful sites from over the summer months. But before I get down to the really heavy duty sorting and editing I thought I’d post a quick snapshot of the typical trials and photo-ops that might meet you on a typical trip out into deepest rural Ireland. Over the years I’ve had my camera bag rifled by pigs at a Portuguese dolmen, nuzzled by horses at an axial stone circle in County Cork, pecked by rooks in Wales and stampeded by sheep near Avebury in England. My encounter with some bullocks in County Louth even made a nice book cover, but these cows I ran into in Kerry really took beastly intrusions to a whole new level. I tried to get a few shots of the badly weathered rock art despite having all my carefully placed kit constantly re-arranged, but it quickly became a losing battle. I think a return trip is in order with some accomplices, purely to keep the cows entertained. If you’ve been a regular visitor to this blog’s Facebook page, you will no doubt have already encountered some posts following my travels around Ireland seeking out and photographing Ireland’s prehistoric rock art. For the most part it is the unreliable Irish weather or bewildering and impenetrable terrain that provide the challenges in locating and recording these prehistoric traces in the landscape. This particular form of rock art that I am most interested in is sometimes described as ‘Atlantic Rock Art’ or ‘Galician Rock Art’ after the main geographic areas in which it is found, from the North West coast of the Iberian Peninsula to the glens of Scotland. I usually just refer to it as rock art though they are often termed ‘cup and ring’ carvings as the prototypical panel consists of dots/cupules/cup marks surrounded by one or more rings. 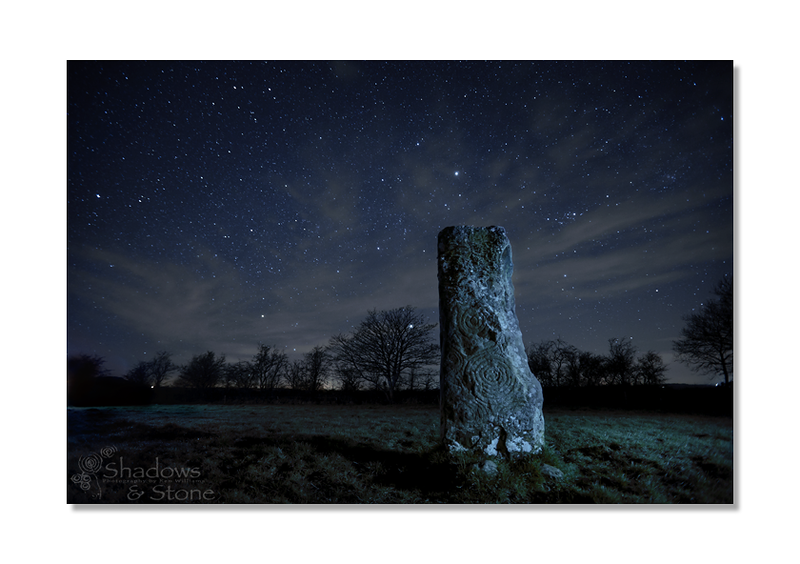 Down a narrow track off a minor country road, the pillar at King’s Mountain sits upright in a field like a beautifully decorated standing stone. This stone however is quite special, being the solitary remaining roofstone or lintel of a long destroyed passage tomb type monument which had been built around 5,500 years ago. Just five kilometers away is one of Ireland’s greatest passage tomb cemeteries from the Neolithic or Late Stone Age, the Loughcrew complex of decorated chambered tombs. These are also visible against the sky from this spot. Meath is a relatively low lying county so even though the hills at Loughcrew are not particularly high, they do dominate the lowlands for many miles around. The site is located on private land down a narrow track, see Knowth.com for more information. Click here if you would like to purchase a print, please specify if you would like image 1,2 or 3 from this page. Conwell, E.A. 1864. On ancient remains, hitherto undescribed, in the County of Meath. Proceedings of the Royal Irish Academy (1st series) 9, 42-50. Conwell, E.A. 1866. Examination of the ancient sepulchral cairns on the Loughcrew Hills, County of Meath. Proceedings of the Royal Irish Academy (1st series) 9, 355-79. Conwell, E.A. 1872. On the identification of the ancient cemetery at Loughcrew, Co. Meath; and the discovery of the tomb of Ollamh Fodhla. Proceedings of the Royal Irish Academy (2nd series) 1 (Literature), 72-106. Herity, M. 1974. Irish passage graves: Neolithic tomb-builders in Ireland and Britain, 2500 BC. Dublin: Irish University Press.